More than just a book. Join the movement. "WARNING! Leading Jesus' Way is a most dangerous book! If you read this book, be ready to radically change your life and your approach to leadership. The results speak for themselves, but the true value is the positive impact you will have on people's lives within your sphere of influence." I already have my copy, and I'm ready to unlock my free learning aids! "There’s no doubt in my mind that Jesus was the greatest leadership role model of all time. 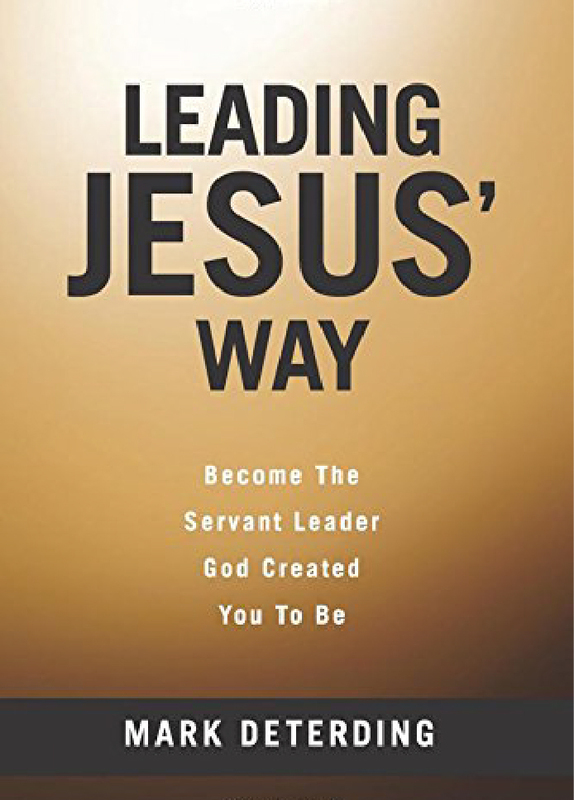 If you want to find out how he did it—and how you, too, can be a servant leader in your organization—read Leading Jesus’ Way. I guarantee you will get both great results and great human satisfaction." "Mark is a credible witness of Jesus-based servant leadership. He speaks it clearly and lives it consistently. Leading Jesus’ Way is powerful for the same two reasons: Mark gives a clear and grounded case for why leading like Jesus is both good faith and good business, and he speaks with a voice that believes what he says and puts that conviction into practice. "Servant leadership is a proven path to engaged, productive, caring team members. The idea of servant leadership is well known. What is not well known is HOW to embrace it. Leading Jesus’ Way, is a proven road map to embracing servant leadership actions every day. The book “clears the path” to creating a purpose driven, values aligned workplace." "Leading Jesus’ Way will impact leaders of all levels. It combines world-class business teaching with solid Biblical teaching. This is a great 1-2 punch that will absolutely transform your business and personal life. I learned and implemented many concrete action items that are having a positive impact on my business and my life." ~Curt Tillotson, Chief Operating Officer, Nahan Printing, Inc.
"Leading Jesus’ Way: Become the Servant Leader God Created You to Be is a gift to leaders who understand that servant-led organizations consistently outperform their peers, but don’t know how to become a servant leader themselves and/or build a culture around it. Mark Deterding debunks the myths of servant leadership (no, it’s not soft), and gives his readers five practical and proven concepts that will build and transform them and the organizations they serve." ~ Jon Ballou, President & CEO, Douglas Machine Inc.
"Biblical principles work – the school of hard knocks has reinforced this for me! Aagard has leveraged the servant leadership training the that Mark outlines in Leading Jesus’ Way to build a company that has more fun, wins more often, and better serves its customers." "Mark Deterding is a living example of servant leadership, and he has written his book with the same wisdom, dedication and respect that guides his life. Mark shows how servant leadership is not a technique, but an approach that can guide every decision you make as a leader and in all aspects of your life." "Jesus is history’s greatest role model of servant leadership. Anyone desiring to be a successful leader would be wise to follow in his footsteps. Mark leads Jesus’ way and has dedicated his life and career to helping others unlock their servant leadership potential. You’ll find this book provides a clear roadmap to becoming a servant leader and it will become a trusted companion that you’ll refer to time and again." "Mark Deterding has had a huge impact on my life. I’ve come to know Mark as a man who not only understands the heart and soul of servant leadership, but also one who truly walks these principles out in his daily life. The principles he shares in Leading Jesus’ Way will give you practical ideas and insights on servant leadership and will fill your heart – and that is where the servant leadership Jesus taught always begins!" "There are thousands of books about leadership but this is the one you need to read! Embracing Mark’s Model of Servant Leadership outlined in Leading Jesus’ Way will transform your life. You can be an effective leader and care about the people you lead by learning how to serve them first." "Mark’s ability to teach and draw upon servant leadership as modeled by Jesus Christ is outstanding. The principles he shares in Leading Jesus’ Way have significantly impacted all aspects of my life and leadership…at home, in business and within my community. I’m confident it will have the same impact on you!" "Reading Leading Jesus’ Way will move your focus from success to significance. It has taught me how my role as an executive leader can have a life changing positive impact on those around me. By following the servant leadership principles outlined in Leading Jesus’ Way, you will become a more effective leader as well as gain personal fulfillment in your life and career." ~ Michael Murphy, Chief Performance Officer, Trend Offset Printing Services, Inc.
"The principles in Leading Jesus’ Way have been the foundation for the transition of our family business from one generation to the next. The biblical principles shared in such practical, user-friendly teachings are so welcoming to all. Your only regret in embracing servant leadership in your personal and professional life will be that you didn't have it earlier in your journey." "The servant leadership principles in Leading Jesus’ Way are life changing. Gaining God’s perspective for the purpose of my life as a servant leader has provided the prospective, energy and focus to make a true difference in my personal and professional life. You will be blessed by leading Jesus’ way!" "Mark outlines a compelling model of servant leadership based on scripture, thoughtful insight and years of proven servant leadership. Leading Jesus' Way will challenge you to understand and embrace the servant leadership Jesus modeled. Get the book! You will be inspired and energized to invest in your character, talent and faith to improve your performance, grow your relationships and transform your leadership." "I’ve worked closely with Mark over the last several years. The servant leadership principles that he so clearly outlines in Leading Jesus’ Way have helped me understand my personal life purpose, and how we drive a culture of servant leadership at Knute Nelson. By leading Jesus’ way our leaders have strengthened our culture beyond measure to grow our capacities to serve and live out our mission." "The exposure to the servant leadership principles in Leading Jesus’ Way has been a life changing experience for me. After 30 plus years in my career I think I am starting to "get it". Focusing on serving people as a leader will make an amazing impact on your life." "Following the game plan outlined in Leading Jesus’ Way has provided just the right boost for my personal life, and has transformed our organization. You will find working through this book as a team will lead to eye-opening truths of what it means to be a servant leader and will build accountability to becoming the servant leader that God created you to be." "Mark’s model of servant leadership outlined in Leading Jesus’ Way has had a tremendous impact on my life, as well as on Douglas Machine. Our leaders have experienced a transformation into leading with a servant’s heart and leading from the bottom up instead of directing. This way of leadership, which comes out of caring for people, is absolutely amazing and will have a positive impact for years to come." ~ Vern Anderson, Chairman, Douglas Machine Inc.
"I have had the privilege of attending Mark's teachings on Servant leadership in community settings, businesses, church oversight teams, a family portrait weekend, and as a personal coach. My wife continues to testify that our weekend with Mark, establishing our Family Portrait, is still the most important weekend of our many years of marriage. Leading Jesus’ Way will empower you to have a greater understanding of the influence servant leadership can have on your life." "Leading Jesus’ Way: Become the Leader God Created You to Be is titled appropriately. This is one of the best primers on servant leadership I have read. Mark Deterding invites his readers into the experience of learning what it means to be an authentic leader who models the life and leadership style of Jesus Christ." ~ Jane Anderson, Social Media Strategist, Insite Skill Inc. I want to buy my copy of Leading Jesus' Way. Hello there. I'm Mark Deterding, author of Leading Jesus' Way and founder of Triune Leadership Services. I'm honored and excited that you're here. My team and I want to fully support you in your servant leadership journey. Please explore these resources that we've built for you. Once you've gotten your feet wet, please feel encouraged to reach out to me directly with any special challenges you may be facing as you take steps to lead Jesus' way. Simply email me: Mark@TriuneLeadershipServices.com. Once you have your copy of Leading Jesus' Way, you can access your free worksheets and learning guides here. Once you've begun embodying the profound biblical principals in Leading Jesus' Way, you may find that you need a deeper level of support. Servant leadership often runs contrary to human nature. It's easy and common to keep slipping into "me first" patterns of behavior. Here at Triune we offer a variety of personalized and group coaching options designed to take you deeper into servant leadership practices and unlock your God-given potential to draw out the very best from yourself and from the people you lead. To learn more about our coaching sessions and packages, you can email me directly: Mark@TriuneLeadershipServices.com. You've committed yourself to leading Jesus' way. You've embedded servant leadership practices in how you work, live, and love. As a result, you've significantly deepened your influence at work, at home, and out in your community. What happens next? As you deepen your influence, I can promise you that other leaders want to know how you are being supported to change. Leading like Jesus forges a profound impact on people. They will want to know how you lead this "new" way. And, you will want to show them. You'll want them to experience the joy, peace, and soul-deep satisfaction of leading like Jesus. That's why we created our online faith-based servant leadership course. Our passion is equipping leaders just like you to elevate not just your own leadership, but the leadership of other key influencers in your workplace, church, and community. You'll want to multiply your impact by training up others. Together, you can move as a team through the 6-week online training course, and learn how to transform your workplace, church, or community into your own pocket of excellence. Learn more about Triune's online course here. Wherever you are in your journey to lead Jesus' Way, you'll benefit from signing up for our faith-based servant leadership blog. You'll get weekly guidance, inspiration, success stories, and tools. In my blog, I don't shy away from the challenges of servant leadership. I tackle them head-on. None of us will get servant leadership perfect, like Jesus did. We're all only human. Sign up for Triune's blog, and you'll get plenty of encouragement to fuel you in leading Jesus' Way and becoming the servant leader God created you to be. I want my free chapter of Leading Jesus' Way.